Over 700 runners took part in the 2007 Tour Du Lac Brome on Saturday June 24th 2007 under ideal running conditions that were not too hot allowing for some record breaking times to be established in this edition of the very popular race here in Knowlton. 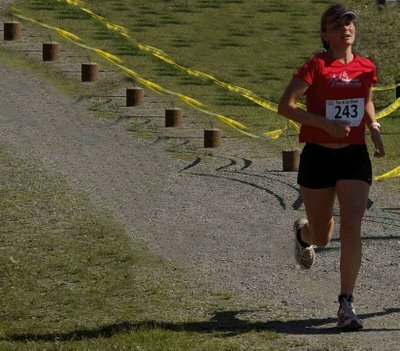 The annual race has been a popular event in Knowlton for years and the Saint-Jean holiday week-end has generally co-operated with great weather for the event that has various distances from 1km to 20km for all level of athletes. 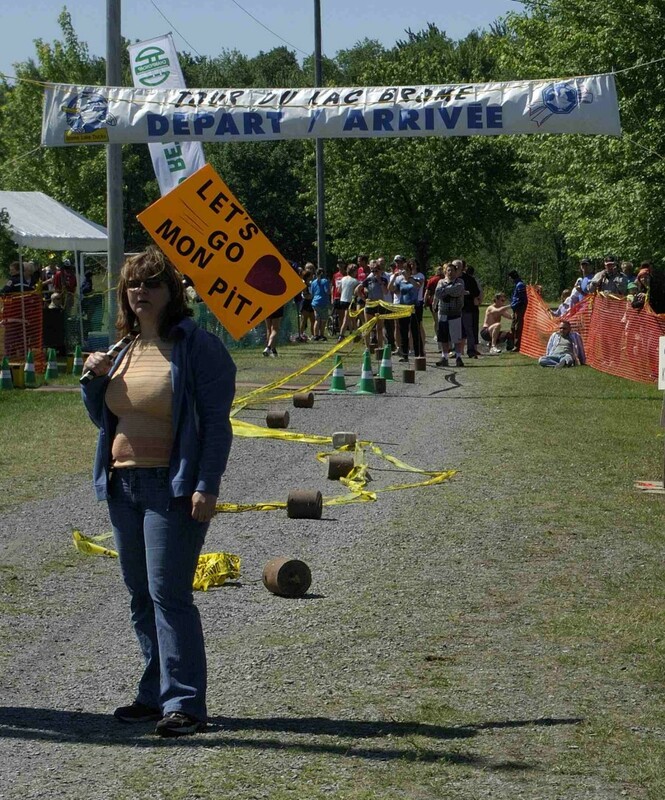 The “Knowlton Marathon” as some people call it, winds through the picturesque streets of Lac Brome and is a healthy alternative for people who want to do more on the Quebec National Holiday than swap Poutine recipes while drinking “Une Gros Cinquante” in the backyard by the pool. While most of us shudder at the thought of having to drive the 16 km to Cowansville to get to the Canadian Tire holiday specials, some brave (crazy?) souls are prepared to lace up their running shoes and actually run 20km…and they seem to enjoy it! There was a great turn-out in the Lions Park for the early morning event and the crowds lined Victoria Street and all along the course we could hear shouts and cheers of encouragement from folks who clapped and encouraged the brave athletes who fought pain and fatigue to give it their best. Maybe this is a great testament to the spirit of La Fete St-Jean? The willingness of Quebecers to be different and push themselves to the limits of physical exhaustion in the pursuit of excellence! Or maybe we are just privileged to witness a gathering of some of the most extremely obsessive folks imaginable! At least there were many runners spotted partaking in a cold beer at the finish line to disprove that a Marathon is any reason to give-up the pleasures and celebrations of a National Holiday. I know that after an hour of yard-work a cold beer is delightful so can only imagine how such a beverage tastes after circling the Lake at a full bore run…heavenly no doubt! The 20 km men’s race was won by the elite runner from Montreal Amor Debhi who beat out 318 other runners and covered the distance in a new course record of 1h 3min 51sec followed by two members of the running club “Les Vainqueurs” Terry Gehl inn 1h 10min 02sec and Jean-Nicolas Duval 1h 12min 49sec . The 20km women’s race was won by Louise Voghel from St Armand who finished with a time of 1h 22min 13sec followed by Tina Kader in 1h 23min 02sec and Charlotte Gouin 1h 27min 17sec. This year’s race almost didn’t happen as sponsorship difficulties left the event in danger of not taking place until the last moments as a group from Montreal had to take over to save the event from extinction. Their efforts and the hard work of the many volunteers paid off in the end and Knowlton once again hosted this fourth round of the provincial foot race in the Pegasus series of Sports Experts. 1. Color code the bibs worn by the runners, eg Red for the 20K, Blue for the 10K and White for the 5K races, this way as the individual racers come thru the park either towards the finish line or passing thru on the 2nd leg, it will be easy for everyone to see which race the participant is running. There were runners crossing the finish line, but we could not tell which race they were from. So it was hard to know who was the 1st winner of each race. Color coding the bibs may also make it easier for organizers and participants to make sure they are in the right race. 2. The banner over the start/finish line was incorrectly labeled and this was said because on a few occasions we watched people switch lanes as then came to the finish. We assume that is because when they looked up at the banner over the actual finish line it showed Depart and over what would be called the Passing lane, it was marked Arrive. People on the sidelines were yelling at the runner to switch back into the correct lane. 3. Instead of having the DJ make any announcements for the race, we suggest you have one of the organizers making the announcements because that person would actually know what he/she would be talking about. The DJ on site did little to help the race's credibility. One of his biggest mistakes took place when announcing where to go for the start of the races was to only announce the starts in French and then only after some people asked him personally to repeat where to go he then announced to the public "sorry for not giving the information in English, I did not realize there were English people in the race". 4. 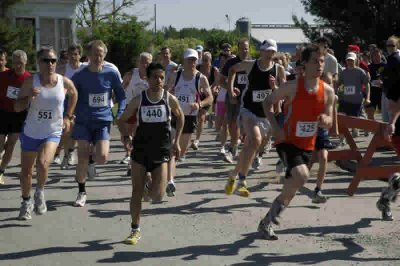 The actual starting lines for the 5, 10 & 20K races remained somewhat of a mystery to probably a number of participants. If the 20K can begin at the starting line within the park, why did the 10K have to begin 100 meters down from the entrance to the park (which by the way your DJ called "the main road", he did not know the name of the road)? And then the 5K race started just before the entrance of the park. If you are going to have 3 different starting points, why not have each of them properly marked with an overhead banner. 5. The local newspapers had a write-up of the event and indicated what streets were being blocked off, but I did not see any public notification on site or in the newspapers of the actual route of each race. Of course any event should welcome comments both good and bad as a form of constructive criticism so everyone involved should remember that the fact that over 700 people registered in the event and many hundreds more turned out to support the event means it was a real success! Knowlton is once again on the map as a great place to host a major sporting event and if the plans of our locals are any indication it looks like there is room for more Quebec sporting events to take place in Lac Brome in the near future. At the end of the day we want to congratulate the athletes and especially our own Isabelle Lambert on her spectacular race! 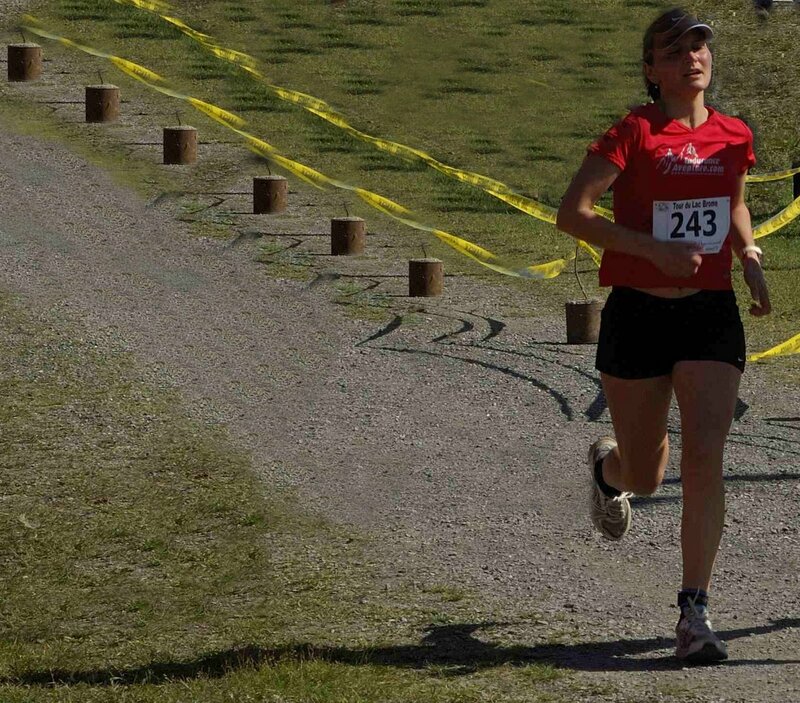 The times off all the runners can be found on the Official Tour Du Lac Brome Website. Photos of the event courtesy of Dade Dudgeon.